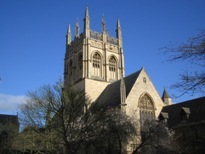 Merton is perhaps most famous for its ringing gallery – the bells are rung from a open gallery around the walls inside the tower with an opening in the centre about 20 feet square and 60 feet from the ground. Five bells are recorded as being cast into a ring of eight in 1657 by Michael Darbie, this being only the second time a complete octave had been cast all at one time. These were considered to be of poor quality and were recast by Christopher Hodson in 1680. Other than retuning in 1982, the bells remain as Hodson cast them making them the oldest complete ring of eight in existence.